A Vaastu reason for non-compatibility is wrong bedroom placement; if you occupy fire's direction, you may feel the heat of clashes. Internal elements in the room—pictures, colours, entry point—also matter. if there's unrest in your married life, you may have wrongly placed a water source in the fire direction or placed the kitchen and its internal elements (like stove and water-sink) in a wrong direction. To improve relations with other family members, check your building structure. If the north is higher than the south, there will be discomfort. Another factor is who oc-cupies the authoritative positions. If a son resides in the southwest, he will be dominating and this could cause clashes between him and his father. If you keep unwell, check if your house has a toilet in the northeast; this may lead to chronic dis-eases and end up in surgical procedures. If a couple occupies a bedroom in the northeast, it may create problems in pregnancy, and could also lead to abnormal offspring. Never point your head to the north when sleeping, as North Pole energy disrupts sleep and creates health problems. Coming to the southwest comer, remember that toilets, bore wells, underground water tanks and swimming pools in this direction also ad-versely affect health and may cause tension and depression. A bedroom in the southeast may cause high blood pressure and chronic irritability. Your plot's east, where the sun rises, is very sen-sitive. Blocking it may result in eye ailments, strokes, paralysis and migraine. Being in debt robs your life of happiness. Block-age of the north—due to heavy furniture, closets, clutter, fewer openings—is a major reason for debts. Also, if the building is elevated from the north, it creates a Vaastu defect. While construct-ing the upper floor, if the north is covered and the south is left vacant, it creates a Vaastu defect. Labour disputes are major factors that create tension in industry and hinder growth. A common Vaastu defect is the placement of fire-related or heat-generating equipment in the northeast. If you are bogged down by legal disputes, check whether your water borings and under-ground water tanks are in the plot's southeast? The southeast is the fireplace, owned by Agni, god of fire. 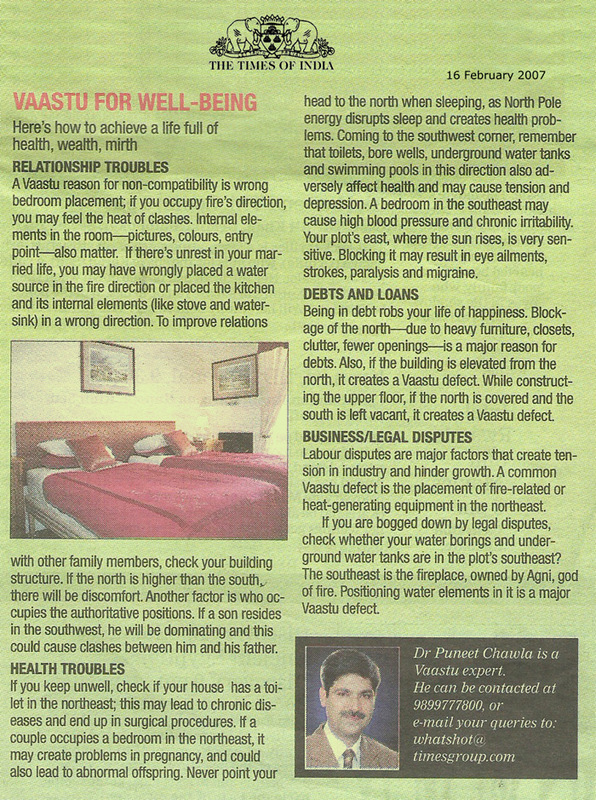 Positioning water elements in it is a major Vaastu defect.